On April Fool’s Day, when the rest of the internet devolves into a cesspool of unfunny press releases and fake product launches, Reddit becomes the most interesting place online by unleashing a social experiment on its enormous community. In past years, Reddit’s mods started a color war, an exponential chatroom, and a countdown button that ran for over two months, inspiring its own cult-like religions. 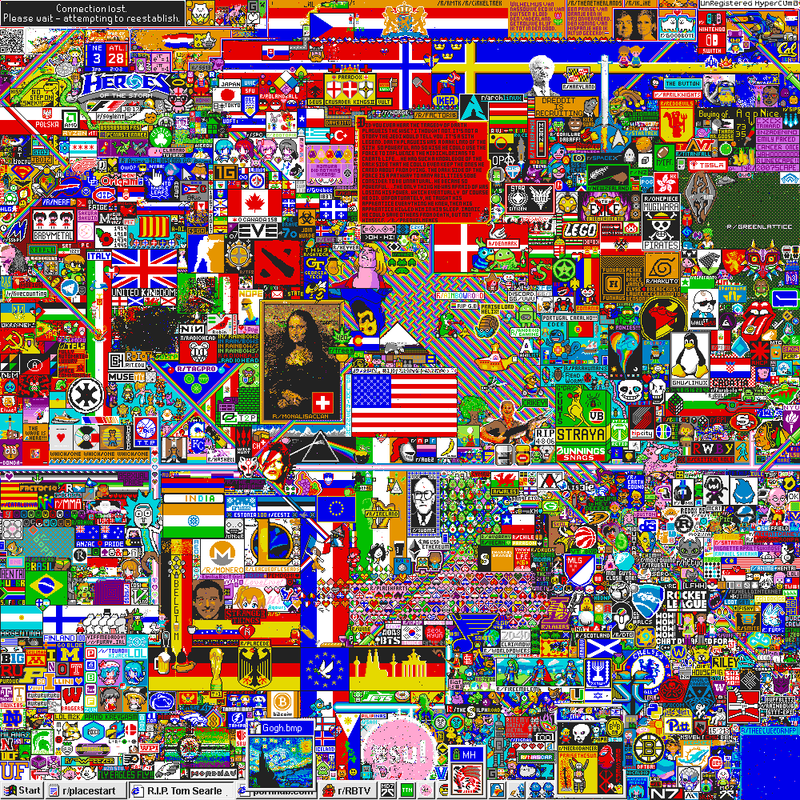 This year, it was Reddit Place, a collaborative canvas of one million pixels. You can color any pixel, but only one pixel every 5-10 minutes. It ended 72 hours later. The end result is about as aesthetically pleasing as Million Dollar Homepage, but even a full-screen 4K timelapse can’t fully convey what happened over those 72 hours. Every tiny patch of the Place is a story. Every piece of real estate represents a hard-fought battle, drawn from the collective activity of hundreds of smaller communities teaming together, and often against each other. Communities were formed solely to rally people to various causes: painting the bottom-right corner blue, making a patch of green lattice, a rainbow road, a series of interlocking hearts, a Windows 95 start menu. The Starry Knights and the Mona Lisa Clan formed to paint pixel art renditions of famous paintings. Another just wanted to tell the the tragedy of Darth Plagueis The Wise. Each community created strategies, locations, and grid-based templates — tools to help make sure their work found its place. And all of them had a common enemy: The Black Void, a group of nihilists repeatedly defacing artwork with a growing, spreading maw of black pixels, only to be repeatedly fought back and incorporated into new pieces. The Place couldn’t have gone on much longer: automated tools were developed to maintain pixel colors, making it more of a technological arms race. So, 72 hours later, the experiment was over. 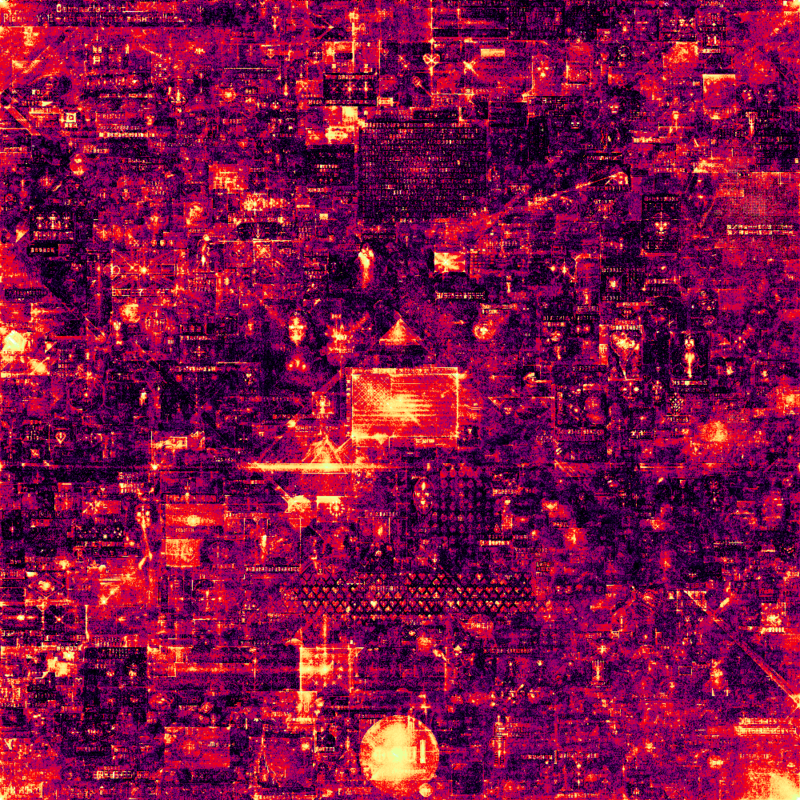 There’s a heatmap timelapse of activity for all 72 hours, and a static heatmap of all activity. (Full data dumps are available, if you like.) The Place Atlas, with close to 1,000 entries, lets you find the story behind nearly every pixel. One person made a live-updating Minecraft server to visualize all Place activity, stacking blocks as pixels change. The final result is browsable as a static render. Reddit can be hard to love. There’s so many wonderfully creative corners of that community, but it’s often drowned out by a noisy minority of hateful scumbags and trolls, emboldened by haphazard management. But on April 1, when the internet is at its most annoying, it’s nice to have an annual reminder of what makes it great — even for a short time.